This Imperial IPA is juicy from Orange zest, with nice tones of Citrus from Citra hops.The falconers flight and cascade hops are accentuated by early grey tea leaves. No bitter bite, all flavor and aroma. Natian has brought back its Imperial Milk Stout from festivals past, but with a blend of pumpkin ale to help spice up the offering. The Imperial Milk Stout is brewed with lactose and chocolate malt then aged on Kahlua soaked oak, while the pumpkin is also brewed with lactose and mild additions of spices to allow the actual pumpkin flavor to come forward. A Light Lager with a kick! A crisp clean Lager with a nice malty flavor. It has a very low hop profile that gives this beer a fantastic flavor filled finish. This summer lager has a delightful citrus kick. This single hop IPL utilizes Citra in multiple steps of the brewing process. Citra is added generously to the boil, hop back and dry hopping to ensure a fragrant presence without the mouth puckering bitterness, balancing the sweetness from the pilsner, two-row and Munich malts. A crisp, and refreshing Dry hopped Northwest pale ale. Brewed with Citra (hops) and infused with cold brewed Earl Grey tea. Brewed with Acai Berries and a touch of Hibiscus, this deep red colored ale is aged on Red Wine soaked Oregon Oak chips. The Acai provides dark cherry, chocolate and Blackberry notes which are accentuated by the red wine. Little to almost absent hop profile but a slight dry after taste helps balance out the juiciness imparted by the fruits, and a combination of grain and grape. This deceptively smooth ale is brewed simply with 2-row and the Zythos® hop blend.. Of course, we don’t stop there! A copious amount of Oregon honey is added, boosting the ABV into imperial range and leaving a crisp, dry finish. The beer is then aged on Oregon oak that has been soaked in Irish whiskey and infused with organically-grown estate Cascade from Natian’s private hop garden. Renamed the Cease and Desist, from McGuinness Stout, due to some naming issuses with...well you figure it out! Big, bold and full-bodied. This midnight-black stout incorporates oatmeal and unfermentable milk sugar, lending the finished beer a subtle sweetness and a full, creamy mouthfeel. The coffee notes from the roasted malt are further complemented by aging on Oregon oak which has been soaked in Kahlúa® coffee liqueur. Brewed in 2014 and aged to perfection! Distinctly American, this IRA has more than a handful of hops. The Zythos® blend of hops is what drives this beer’s pungent aroma and elevated bitterness. The hop profile sets up against a decidedly more malty backbone. Layered to satisfy any malt-lover, it is delicately balanced with enough bitterness to clean up the palate for another sip or another round. A style originally brewed in Vienna and brought to Mexico by Austrian brewers. We use the same Mexican lager yeast strain to produce the Knockback, which comes in at a very sessionable 4.4% ABV. With organic ingredients and greater freshness, depth of flavor and body than modern examples, this slightly malt-forward but extremely drinkable beer pairs well with almost any food. We stop just short of calling this a “Session IPA” at 5.5% ABV, but hop-philes and hop-curious alike can enjoy more than one. This IPA has an assertive but rounded bitterness level due to the hop-bursting technique utilized during the brewing process. A blend of Falconer’s Flight®, Zythos®, Palisades and Cascade hops are used late in the boil and for heavy dry-hopping, creating a complex hoppy flavor and aroma without fatiguing the palate with excessive bitterness. Roasted malts balanced out with the star hop in this recipe, Amarillo. It’s a dark twist on an IPA. Palisade hops were added throughout the boil and dry hop schedule, along with high alpha American hops for bittering, Noble hops for aroma and a few other varieties in-between to balance the heavy malt profile. Rum soaked Oregon oak spires added during the final stages of fermentation bring flavor notes of caramel and vanilla to complement the bitterness. Stout in the summer?! The Lumberjane doesn’t mess around when it comes to delivering on its promise of stout roast flavor. Where it surprises though, is in the balanced, almost dry finish. The Lumberjane is an unapologetically substantial, but easy-drinking, year- round stout that won’t chop down your palate with excessive body or sweetness. There’s a little bit of summer in every pint of this smooth, easy-drinking and hoppy Blonde Ale. A strong hop bouquet and a very present, but soft and balanced bitterness counterpoints the subtle malt profile in this year-round crowd pleaser. Do you want information about our Tasting Room? 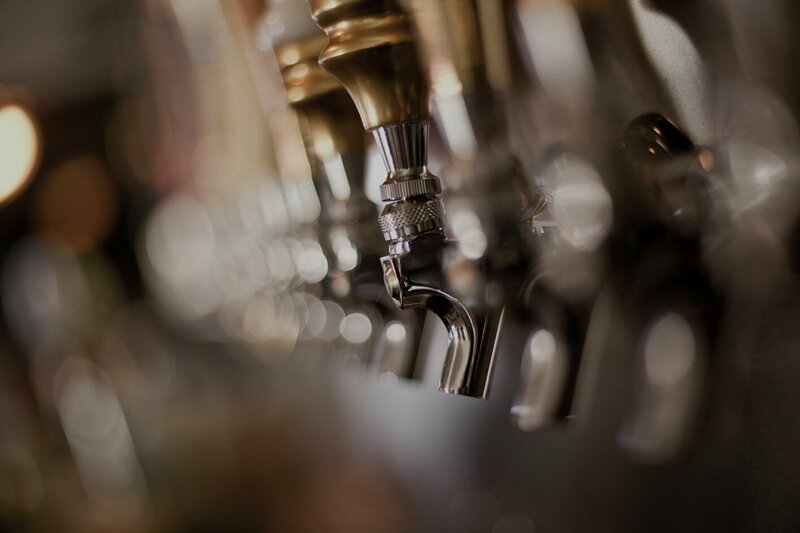 Click the button below to find information on our location, hours, current beers on tap, and more!